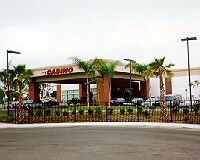 The Current Web Page that you are on now is for Card Casinos of Southern California. Open 24 hours a day, 7 days a week. Age 21 over. The Bicycle Club Casino is huge. Valet parking in front. Self parking in the lot in the back just off of Live Oak. Large, spacious and well appointed. Most card games including Poker and 21st Century Blackjack. Lots of Asian games including Asian 5 Card Stud (32 Card Deck), Chinese Poker (13 Card Poker), Pai Gow Poker, Pai Gow Tiles, and Super Pan 9. Live At The Bike - The Bike has a segment on its web site called "Live at the Bike." Fourteen cameras pick up unscripted and unedited poker action with real players and real money. This is broadcast live through streaming video every Wednesday-Saturday 6pm-10pm PST. You can register at The Bike. Lounge with life entertainment. Gift shop. Beauty Salon. Canfield's restaurant. Centrally located just of the freeway south of Downtown Los Angeles at the 710 Freeway and Florence. Just off of the 710 Freeway midway between I-10 and I-105 Freeways. From 710 Freeway (Long Beach Freeway) exit Florence Avenue. 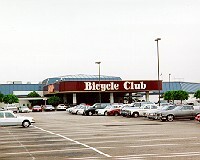 The Bicycle Club Casino is immediately adjacent the 710 Freeway at the southeast intersection of the 710 and Florence. From 710 go east one short block on Florence and turn right. Open 24 hours a day, 7 days a week. Age 21 and over. Large well appointed building with two large gaming areas separated by the various restaurants. Some side areas. Table gaming. Most styles including Five Card Draw, Five Card Lowball, Jacks Back (Hig/hLow), 7 Card Stud, 7 Card Razz (Lowball), 7 Card High/Low Split, Texas Hold'em. Asian Poker, Asian Stud Poker (32 Cards) and Super Pan 9. A short distance southeast of downtown Los Angeles. Near the intersection of the I-710 (Long Beach Freeway) and I-5 (Santa Ana Freeway). From the I-5 take the Washington Blvd. exit. Open 24 hours a day, 7 days a week. 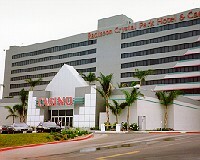 Located at the base of the Radisson Crystal Park Hotel & Casino. Expands over several ground level rooms. Table gaming. All popular California games and variations of poker are played. L.A. Blackjack, Pai Gow Poker, Super Pan 9 and Pai Gow. Poker also includes Hold'em, 7 Card Stud, Omaha, Lowball, Draw, 13-Card (Chinese) Poker and Pan. Restaurant and lounge. Live entertainment many nights of the week. 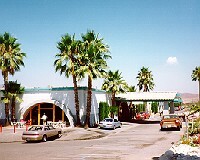 The Hotel has 226 guest rooms, health spa, gift shop, restaurant. There are five Presidential Theme suites. Located in the prominent building with the red and green neon starburst pattern on the north side of I-91 Freeway just west of the I-710 Freeway (Long Beach Freeway). Just 12 miles east of Los Angeles Airport and about 20 minutes from downtown Los Angeles. From I-91 (Gardena/Artesia Freeway) take the Acacia exit. Open 24 hours, 7 days a week. This is a Card Casino. Asian games such as Blackjack, Pai Gow Poker, Pan-9, Pai GowTiles. Poker such as Texas Hold'em, 7-Card Stud HiLo Split, Omaha Hi-Lo, 7-Card Stud. North of Los Angeles - 405 South to 605 North. Exit Carson Heading East. Casino is Located at First Light on Left. Located at world famous Hollywood Park Racetrack, the beautiful art deco styled casino has 120 tables of poker and California gaming action. 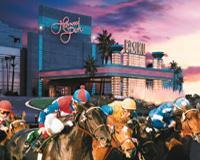 Live and simulcast horse betting is also conducted at the casino in addition to nightly bingo and live entertainment. Other amenities: Restaurant, deli, sports lounge, hair salon, health club & massage center, valet and free self parking. 3 miles east of LAX airport at the corner of Century & Prairie. Head north to Century off the 105 FWY (Prairie exit) or east to Prairie off the 405 FWY. There are 36 poker and 19 California games tables in this plush facility. Located on the Southwest corner of Redondo Beach Boulevard and Vermont Avenue, one block west of the Harbor (110) Freeway. Table gaming. Hold'em and Omaha Poker held on alternate days of the week. Special Poker Tournaments held. 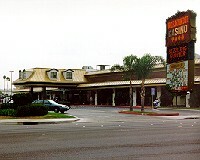 The casino is in the large room near the entrance to the Lake Elsinore Resort. Free parking. From I-15 take Diamond Drive/Railroad Canyon Road exit. South on Diamond for one block then left on Casino Drive. Take Casino Drive to the end. Turn right then right into the parking lot. Open 24 hours a day, 7 days a week. Age 21 and over. Most table gaming including Texas Hold'em, 7 Card Stud, Lowball, Draw. Popular Asian games in the Red Dragon Room including Pai Gow Poker and Lucky 9 or Super Pan 9. Snack bar and gift shop. Catering services. Showroom and entertainment (reservations 800-894-2625). Northwest of intersection of the Harbor (110) Freeway and Artesia (91) Freeway. From the 110 Freeway (Harbor Freeway) exit at Rosecrans. Continue west on Rosecrans. 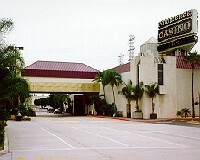 Normandie Casino is on the right. Table gaming featuring 21st Century Blackjack, Poker (Hold'em, 7 Card Stud, Omaha Hi-Lo, Pot Limit), Pai Gow and Pan. Rat Pack Lounge features live entertainment and a classic menu for breakfast, lunch and dinner. In Oceanside just off the I-5 Freeway. From the I-5 Freeway, take the Mission Blvd. exit and continue east on Mission Blvd. Take the first right.